A goal setting tool that helps you build success, not just measure it. Get started on your success with a 30 day trial. Thriveboards is an easy to use tool that gives everyone in your organization access to understand, get excited about and achieve the initiatives that will mean success for your business. The transparency of individual, team and company goals helps your organization stay coordinated and on track, working on the right things at the right times. With Thriveboards, you keep your vision front and center and work on tasks and actions that support your most important goals and initiatives. Easily monitor the individual, team and company progress on your most important business initiatives. With Thriveboards, everyone in your organization will be able to see and understand the goals and tasks that are the most important to your business, helping them to prioritize, stay on track and get things done. Ensuring that people clearly understand how their individual goals support the overall goals of the company, leads to naturally more engaged employees and groups. Continuous communication and tracking means you can deliver relevant performance coaching and keep the focus on your top-priority initatives. Keep your goals on track, make sure the right people are working on the right tasks, and get things done. 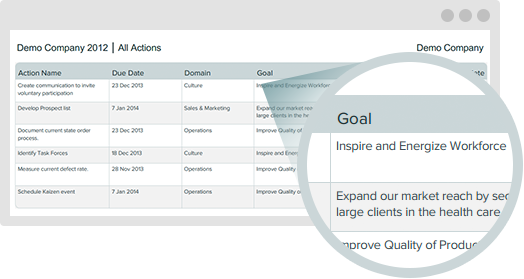 With Thriveboards, you can easily prioritize goals so that everyone can focus on the most important actions to accelerate your business objectives. By aligning individual, team and company goals, you create improved productivity and a more engaged workforce. First, you create the categories that make a difference in your business. 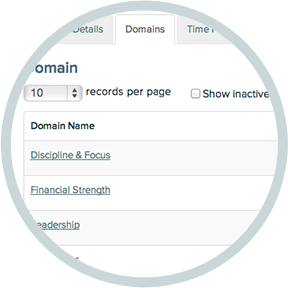 Then, you set and track goals for each domain. Assigning weights to both domains and goals helps prioritize the most important activities and keep everyone on task without the need to micro-manage. Thriveboards provides real time collaboration to adjust goals and tasks as needed and help your team achieve more. Having a tool that ensures the right things are done, at the right time, by the right people gives you the time to focus on building success. Not all goals are created equal, but all of the goals you create are important to your bottom line. The challenge is finding an easy and understandable way to prioritize them for your team. 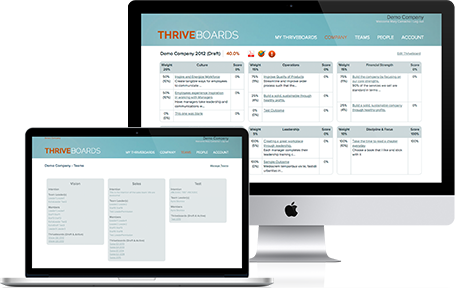 Thriveboards allows you to prioritize and track the goals for individuals, groups and your company, so that you can stay focused to achieve your strategic objectives. Priorities are set by giving weights to categories and individual goals, which gives clarity to the importance of each goal and makes scoring for results easy and relevant. 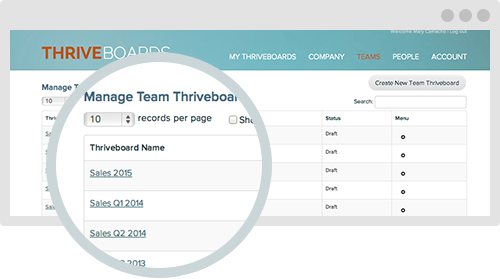 With Thriveboards, you can align individual, team and company goals. Linking individual goals and team goals to the overall strategic initiatives of the company gives employees an understanding of their value in regards to the "big picture". When each person and team is working toward the same objective, execution happens faster and more efficiently. 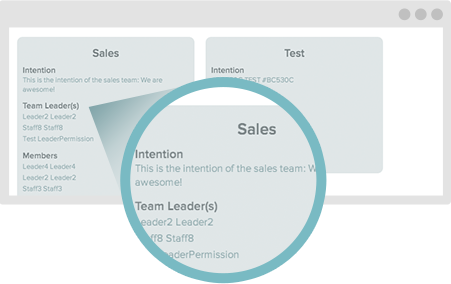 Keep everyone in sync by monitoring your success on the individual, team and company levels. And, enhance accountability by setting relevant, measurable goals. Thriveboards is a system that provides a tangible and easy way to account for the intangibles that impact your bottom line. It allows you to track factors such as your customer experience in a real way that will make a difference in your business. The various types of metrics encourage better goals, and you are able to measure expectations, experience, and improvements over time. 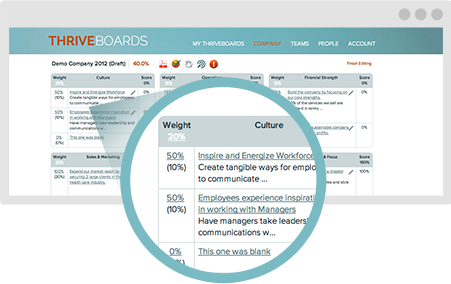 Thriveboards is a valuable goal setting system that helps to increase employee productivity, accountability and motivation. When employees know your company's business objectives, they are able to create individual goals that are better aligned with the company's success and can focus their efforts on the most meaningful tasks. Employee engagement is naturally enhanced when each person understands what is expected of them, as well as the value they bring to the success of the overall company strategy. Real time collaboration and scoring helps keep each person on track and motivated. By having goals weighted, employees can easily determine their highest priorities, and make sure that they are working on the right things at the right time. Looking for Consulting, Coaching, or Rollout Support in your Company?